Amaranth is such a neglected gluten-free foodstuff. Its earthy undertones maybe put some people off of it but I’ve really got into those sorts of flavours of late. And anyway, when you make anything into porridge, you can mask all sorts with a good dollop of peanut butter or fresh berries and banana. The first time I made amaranth porridge, I messed up my quantities and ended up eating 3 people’s worth of the stuff in one sitting. I was so full… but if I was able to eat 3 people’s worth then it must be good stuff! 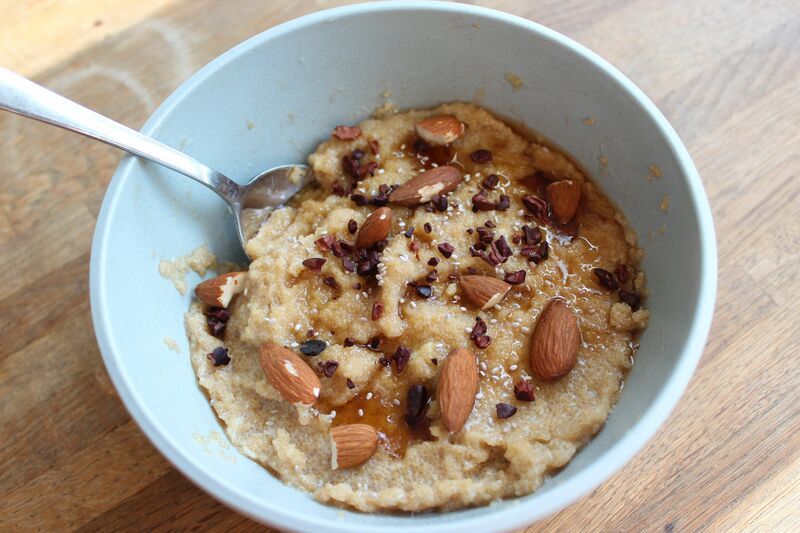 I often suggest sweetening things with honey or maple syrup, but at home, I generally just sweeten things like porridge naturally using banana. Mash one up in a bowl and when your amaranth porridge is ready, pour the contents of the pan on top of the banana and mix it together. The result is a delicately sweetened creamy breakfast bowl with added fibre, and no 11am sugar crash. The base recipe for amaranth porridge is very simple and follows exactly the same steps as my how to make amaranth tutorial, except use milk to boil the grain, rather than water. Everything else can be chucked in your bowl at the end, providing you with a nourishing bowl that will keep you feeling full right up until lunch! Combine milk and amaranth in a pan with a tight fitting lid. Bring to the boil. Once boiling, reduce heat to low and place the lid on the pan. Simmer for 20 minutes. Meanwhile, mash a banana in a bowl. When the liquid is absorbed, you should have a creamy mixture. Divide between 2 serving bowls. Mix the mashed banana through the amaranth and top with whatever toppings you desire. I used maple syrup, cacao nibs, almonds, and popped amaranth.